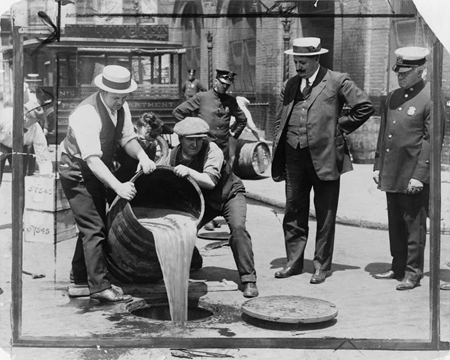 Today in History–October 28–the Library of Congress features temperance and prohibition. On this day in 1919, Congress passed the Volstead Act which allowed for enforcement of the Eighteenth Amendment to the Constitution. Lauded by temperance societies and referred to as the Prohibition Amendment, the Eighteenth Amendment prohibited the “manufacture, sale, or transportation of intoxicating liquors” in the United States. Learn more by visiting the Today in History section then click the links below to access more related primary sources. Does anyone know who took this photo in the early 1900’s? I need to know for a research outline primary source. If you are referring to the photo at the top of the post, clicking on it will take you to the item’s bibliographic record. There you will see that it “Forms part of: New York World-Telegram and the Sun Newspaper Photograph Collection”. Since no individual is listed, in this instance the creator would be the organization: New York World-Telegram and the Sun.